WWVB is a low-frequency station, operated by NIST, that provides precise time information to radio-controlled clocks across North America. The WWVB signal is sent from a transmitter in Fort Collins, Colorado, on a carrier frequency of 60 kilohertz (kHz). The devices that use WWVB interpret the digital time code transmitted by the station to stay in sync with NIST’s atomic clocks in Boulder, Colorado. While atomic clocks are fascinating, and WWVB provides a vital service, I’m only interested in the amplitude, or strength, of its signal. You see, I am part of a team of researchers organizing the EclipseMob experiment, and WWVB is our key to understanding how the ionosphere changes during a solar eclipse—and what that means for radio communications. For those of you who have been distancing yourselves from news and social media over the past several months, I have exciting news: A total solar eclipse will cross the United States on Monday, August 21. A total solar eclipse is a relatively rare event, and the August 21 eclipse is even rarer in that it will pass over a highly populated land mass. Roughly two-thirds of Earth’s surface is covered by water, so naturally, most total eclipses pass over water rather than land, and even those that do pass over land often do so in places where few people live. A total eclipse that will be seen from Oregon to South Carolina is, therefore, cause for celebration. In addition to being a good opportunity to celebrate, the total eclipse is also a good opportunity to do science. A layer of charged particles, called the ionosphere, surrounds Earth, extending from about 80 to 650 kilometers (50 to 400 miles) above the surface of the planet. Credit: NASA EclipseMob is a crowdsourced effort to gather radio wave measurements from across the U.S. during the August 21 eclipse. Why on earth would we want to do this? 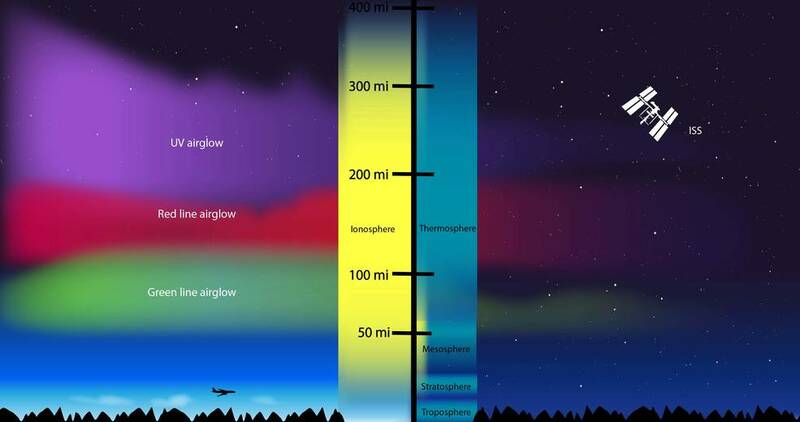 How far low-frequency radio waves travel and how much energy they have when they arrive are affected by the state of the ionosphere, a region of Earth’s atmosphere that extends from about 80 to 650 kilometers (50-400 miles) above Earth’s surface. The ionosphere itself comprises four layers: D, which is closest to Earth’s surface; E; F1; and F2, which is farthest from the Earth’s surface. When the sun’s rays hit the ionosphere, they free electrons from some of the atoms in these layers, leaving the atoms floating there positively charged, or ionized. When the D layer is ionized by the sun’s rays, it absorbs low-frequency radio waves, so WWVB waves that travel into the ionosphere seem to disappear. Hence, in daylight, these waves can travel only along Earth’s surface, i.e., as ground waves. When the sun’s rays are no longer reaching the ionosphere, the ionized atoms and electrons recombine in a process called “recombination,” for obvious reasons. Recombination takes place more rapidly in the D layer than in the upper layers of the ionosphere. Once that happens, low-frequency radio waves can then pass through the D layer to the upper layers, where they are reflected back to Earth, often with additional energy contributed by the ionosphere. By bouncing back and forth between Earth’s surface and the ionosphere, radio signals can—as sky waves—travel much longer distances than they can as ground waves. If you have ever listened to AM radio (possibly an unusual pastime now), you may have noticed that you can hear stations from much farther away at night than you can during the day. The sun’s effect on the ionosphere is the reason for this. A layer of charged particles, called the ionosphere, surrounds Earth, extending from about 80 to 650 kilometers (50 to 400 miles) above the surface of the planet. A solar eclipse gives us the opportunity observe the effects of ionization and recombination on a much shorter timescale. Rather than requiring hours to transition from light to dark, during an eclipse, this transition—and the transition back to light—takes place in a matter of minutes. An additional benefit of studying the ionosphere during an eclipse is that the angle of the sun’s rays won’t have time to change very much. The angle of the sun’s rays relative to Earth changes dramatically during sunrise and sunset—which is why they appear so colorful—but the angle is nearly constant during the short time period of the eclipse, so this factor can’t complicate our results. The unique aim of EclipseMob is to use a citizen science platform to obtain data from many locations so that we can study how the relative location of the transmitter, eclipse path, and receiver affect the amplitude of the signal we receive. Because WWVB’s signal can be received nearly anywhere in the continental U.S., and because we know the information it will be transmitting, it is the ideal thing to measure for our project. So where did the idea for the EclipseMob project come from? It was the brainchild of Bill Liles, a retired engineer and ham radio enthusiast who knows far too much about the history of ionospheric research for his own good. Bill had been reading about experiments scientists conducted in times gone by (more on this below) and was fascinated by their unique, and not entirely explainable, observations. Bill was convinced that the 2017 eclipse would provide the perfect opportunity to better understand what was happening in the ionosphere. With his amateur radio expertise, engineering background, and the unscheduled days of retirement on his side, Bill set out to design a large-scale data-collection effort. He shared his vision with fellow amateur radio operator Laura Lukes, a geoscience educator who serves as Assistant Director of the Center for Teaching and Faculty Excellence at George Mason University’s Stearns Center for Teaching and Learning. Laura is well known for her ability to transform into a science outreach superhero at a moment’s notice, and she immediately began scheming about how to get citizen scientists from across the country to help us collect radio signals during the solar eclipse. Remembering my near-obsession for analyzing signals, Laura invited me to join the effort, and I happily accepted. Bill, Laura and I soon realized that the project team also needed an electromagnetics expert. After all, the first stage of any radio receiver is an antenna, and a well-designed antenna is critical to successfully observing a signal. Fortunately, K.C. Kerby-Patel, an engineering professor at the University of Massachusetts Boston, was willing to fill that role, and she brought incredible electronics skills to boot. Jennifer Henry and Janet Oputa share the EclipseMob project with attendees at the NCAR/UCAR eclipse media event. In this case, the attendee is Madhulika Guhathakurta, an astrophysicist and lead program scientist for NASA’s “Living With a Star” (LWS) initiative. Of course, there’s no citizen science without the citizens, so connecting with willing participants in as many locations as possible has been an absolute necessity. Fortunately, we recruited two fearless George Mason University students, Janet Oputa and Jennifer Henry, to coordinate outreach and communications for the project. 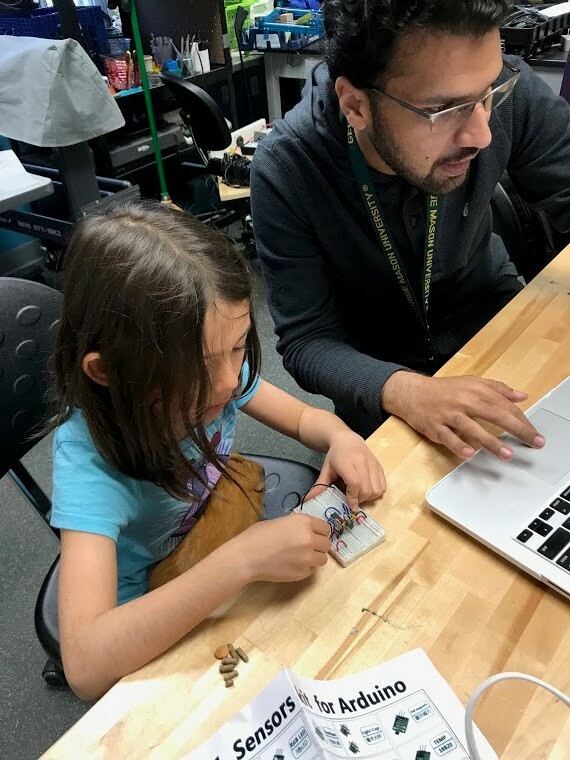 They spread the word via our website and social media, represented EclipseMob at various educational events, and coordinated receiver build events here at George Mason. Short of traveling to the Dakotas to recruit participants at grocery stores and gas stations (South Dakotans, if you’re reading this, we need you! ), Janet and Jennifer have done everything we could hope for and more to build the mob. We on the EclipseMob team are certainly not the first people to study radio wave propagation during a solar eclipse. William Eccles performed the first experiment back in 1912, but equipment and data processing have advanced quite a bit in the past 105 years. Also, Eccles didn’t have the luxury of receiving WWVB, which wasn’t established until 1963. A more recent experiment that motivated the EclipseMob effort took place in Europe during a 1999 solar eclipse. Five amateur radio operators, each at a different location, observed the signal from a 75 KHz transmitter in Switzerland. Rather than observing a simple rise in signal amplitude during the eclipse, the operators observed the signal amplitude making various types of “W’s”—a phenomenon where the signal goes down, up, down and up again before leveling off, creating a “W” shape on the graph. Why this happens is not fully understood, and we hope that the geographically diverse radio signal data the EclipseMob will collect will shed light (see what I did there?) on how the sun’s rays affect the ionosphere. A young citizen scientist and her guinea pig assistant assemble an EclipseMob receiver with staff at the George Mason University MIX space. To bring the EclipseMob project from our minds to reality, we somehow needed to put low-frequency receivers in the hands of citizen scientists across the continental U.S. 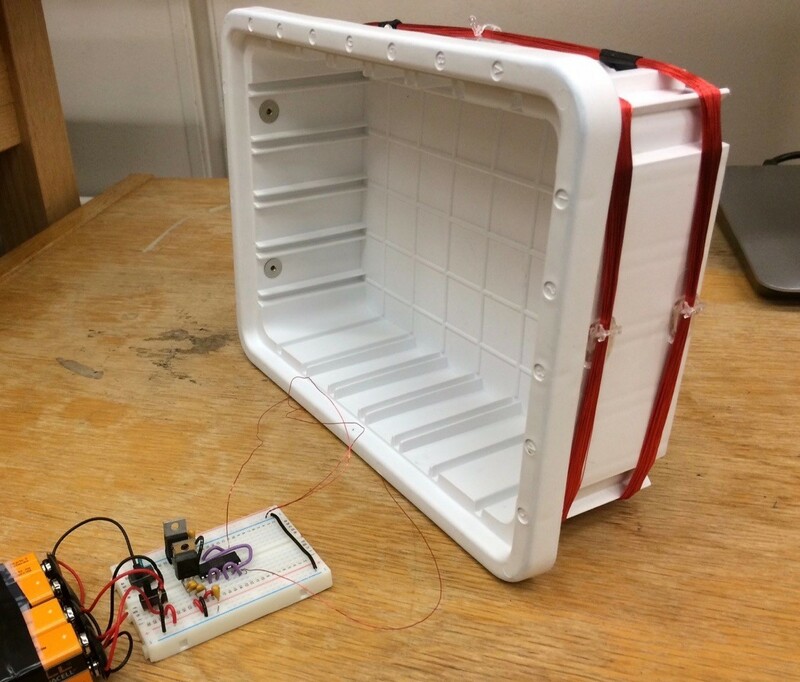 The first challenge we faced was designing a receiver that was relatively inexpensive and could be constructed without significant prior knowledge of electronics or radio communications. Eager to bring students into the project, we presented the chance to design the receiver to some of K.C. 's engineering students who were looking to complete their senior capstone design course. They delivered, and their receiver design formed the foundation of what eventually became the official EclipseMob receiver. In the official receiver, the WWVB radio signal is picked up by the antenna and passed to the circuit, which shifts the signal down from 60 kHz to 18.2 kHz. Now in the audio band (roughly 20 Hz to 20 kHz), the frequency-shifted signal is fed to a smartphone via the headphone jack. Participants can start and stop data collection, view the frequency content of the signal they are observing, and upload their data to the EclipseMob server using a specialized app, also designed by K.C. and her team at UMASS Boston. Our next challenge was to find the smoothest way to get people across the country to build receivers and collect data for the EclipseMob. We decided that the best approach would be to compile all the parts necessary for the receiver and distribute these “receiver kits” to participants. It’s sort of like IKEA for radio receivers, though we didn’t give the kit a funny name. Completed EclipseMob receiver antenna. The box in which the kit ships forms the frame for the antenna, and wire is wrapped around it to produce the antenna coils. The National Science Foundation provided grants (1638685 and 1638697) to both George Mason and UMass Boston to support the project, and these funded the purchase of the parts we needed to build 150 kits. We quickly learned that obtaining parts for 150 receivers with such a short turnaround time is easier said than done. Finding enough parts involved haranguing many different suppliers, paying close attention to ever-changing inventories, and meticulous bookkeeping. (“Backorder” is now considered a bad word among the EclipseMob team.) After much gnashing of teeth, the UMass Boston team finally sent out the last of the 150 kits in late July, giving us all a chance to rest up before the big day. Even though kits are no longer available, it’s not too late to join the project. Some participants are ordering their own parts, and others are building alternative receivers using equipment they have on hand. If you’re not up for building a receiver, but you’d like to explore the data we collect (who doesn’t love data? ), keep an eye on our website. We’re planning to construct an interactive map that will allow website visitors to look at the behavior of the WWVB signal’s amplitude at different collection locations and put forward their own hypotheses about where those “W’s” are coming from. Oh, and if you can’t be part of the project this time around, be assured that we’re already plotting EclipseMob 2.0, so put the April 8, 2024, total eclipse on your calendar now—and book a hotel room while you still can! Excellent job Jill. I'm not sure if I'm speechless because I'm impressed or impressed because I'm speechless. It usually takes a lot to make me speechless but you've done it. Congratulation on a job well done. You explained it well and your usual sense of humor made it fun to read as well as being educational. Your family is proud of you and I can almost see and hear Grandma Nelson cheering you on. I agree. This was excellent, as I was reading the Radio Waves section, I felt you were going to say something about the difference between AM radio at night. I always wondered about that as a GenX kid and you explained it well. I still listen to AM radio on occasion. Oh, and I'll be part of the EclipseMob 2.0 in 2024.